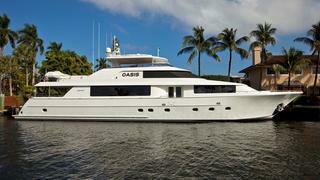 The 34.14 metre motor yacht Oasis, jointly listed for sale by Worth Avenue Yachts and MacGregor Yachts, has been sold with Chris Carrere at Galati Yacht Sales acting for the buyer. Built in GRP by US yard Westport to a design by Jack Sarin, she was delivered in 2005 and refitted in 2014. Accommodation is for eight guests in four cabins consisting of a master suite, a VIP suite forward of the galley with its own private entrance and port and starboard twins. All cabins have full en-suite facilities and the starboard twin can convert to a queen bed arrangement. The aft deck allows for al fresco entertainment and dining, with a high-gloss teak table surrounded by six matching teak chairs and a full wet bar. Sliding glass doors lead from the aft deck into a spacious saloon boasting rich satin cherry wood cabinetry and refined styling. A drop-down television screen in the centre of the main saloon separates the lounge area from the formal dining space, which comfortably seats eight guests. The flybridge comes complete with everything needed for outdoor living including a bar, sink, fridge, ice maker, electric grill and a large television screen. Complete with a towed tender for island hopping and equipped with a range of water toys to keep even the most active guests fully occupied, Oasis is ideally set up for fun on the water. An exceptional example of the highly successful Westport 112 series, she includes many upgrades over a standard Westport. Oasis features a stylish interior complemented by luxurious finishing touches, an enhanced audio/visual system, a hydraulic passarelle and an ASea power converter enabling her to travel across the globe. Twin 16V 2000 M91 MTU diesel engines give her a cruising range of 2,200 nautical miles at 20 knots. Lying in Clearwater, Florida, Oasis was asking $5,949,000.